Mutations in the guanosine diphosphate mannose (GDP-mannose) pyrophosphorylase B (GMPPB) gene are rare. To date, 72 cases with GMPPB gene mutations have been reported. Herein, we reported a case of a 29-year-old Chinese male presenting with limb-girdle muscular dystrophy (LGMD) who was found to have two heterozygous GMPPB mutations. The patient had a progressive limb weakness for 19 years. His parents and elder brother were normal. On examination he had a waddling gait, and absent tendon reflexes in all four limbs. Electromyography showed myogenic damage. Muscle magnetic resonance imaging (MRI) showed fatty degeneration in the bilateral medial thigh muscles. High throughput gene panel sequencing revealed that the patient carried compound heterozygous mutations in the GMPPB gene, c.553C>T (p.R185C, maternal inheritance) and c.346C>T (p.P116S, paternal inheritance). 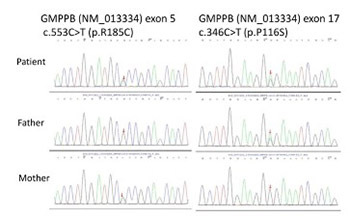 This case provides additional information regarding the phenotypic spectrum of GMPPB mutations in the Chinese population.